My girl has just about finished her first year of school, I've loved making her lunches every day and I like to mix things up but unfortunately she's not very adventurous, some days I can fool her but not very often. Bento style lunches are so much fun and it always manages to put a smile on my girl's face. She has homemade sushi at least twice a week, she'd eat it every day if she could! 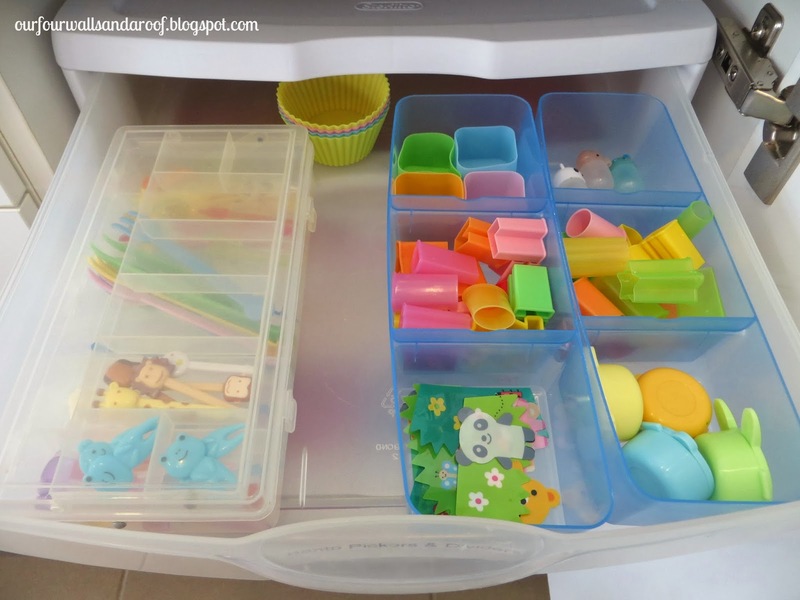 I like to have everything in its place and decided when my daughter started school that I would set up a lunch box area. I've had it a few different ways but how I have it now is working really well. I'd love to try Easylunchboxes or PlanetBox. Currently I'm loving Laptop Lunches and will be getting more soon as I like to pack a few days in advance to make the mornings easy. I live in the tropics and the lunch box must be able to fit into a small esky with a couple of ice packs, the classrooms don't have fridges for school lunches. I have the Bento accessories on the top shelf in a drawer set and on the bottom shelf is lunch boxes, carry cases and containers. 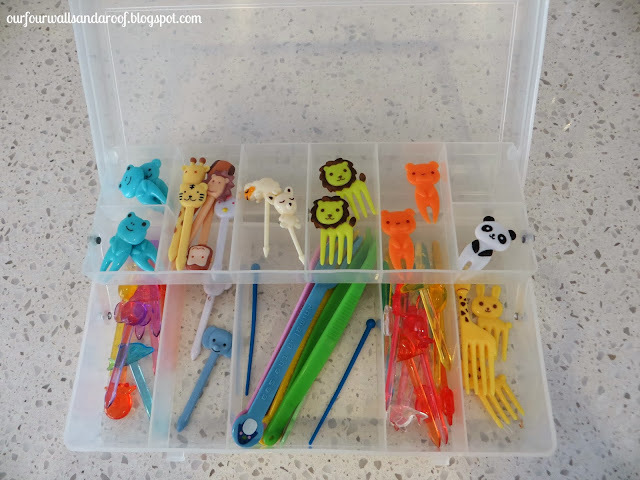 I purchased this drawer set from Howard Storage World and first used it for my make-up in the bathroom, I don't own much make up and decided to repurpose it for the Bento accessories and I couldn't be happier with how it's working out. In the top shelf I have bento pickers, dividers and small containers. The clear container is a small tackle box and the blue plastic organisers are from inside a stackable container which I use elsewhere. 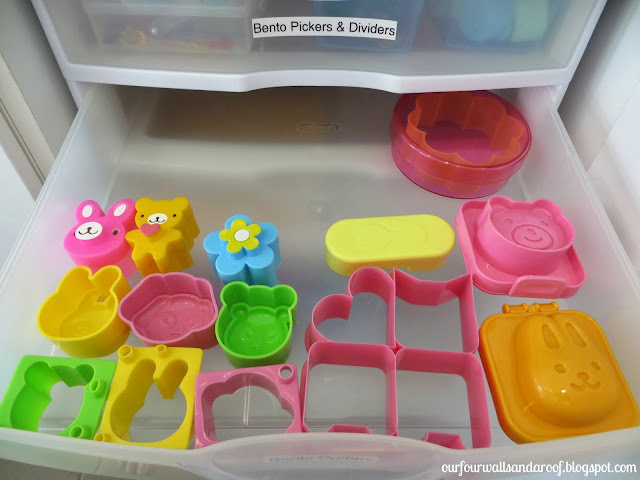 I use the silicone cupcake cases to separate fruit in the Laptop Lunches. The middle drawer holds everything that I use to mold or cut, I need to get a few more items for my boy. The last drawers stores napkins and utensils. 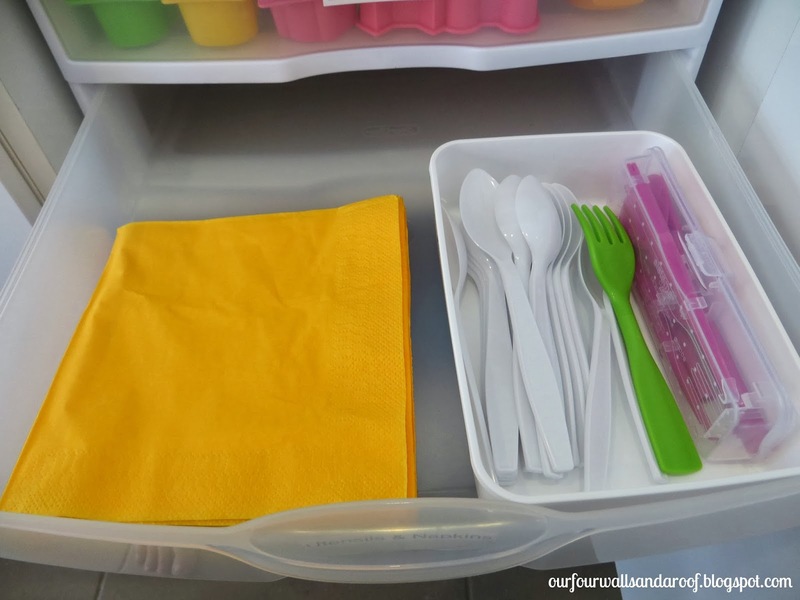 In the white container is a knife, fork and spoon set. I send in the white plastic spoons because my silverware was not making it's way home. I have a pretty basic Bento accessories setup, I'd love to add to my collection. 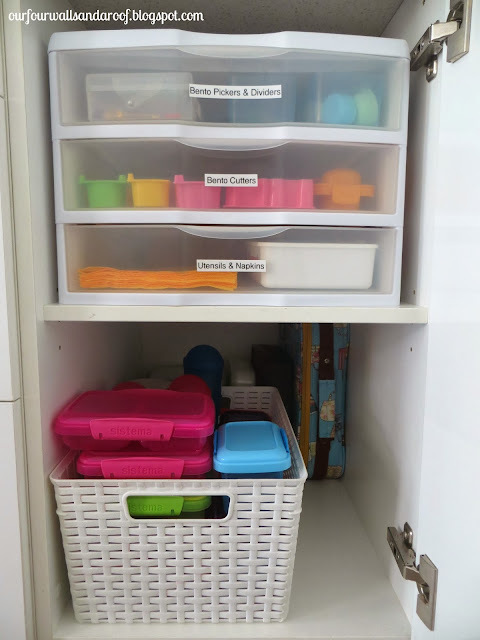 At the back on the bottom shelf are the lunch boxes, I use the black Laptop Lunches box for my daughter at school as it fits perfectly in her esky. The others I use for my son who is not at school. 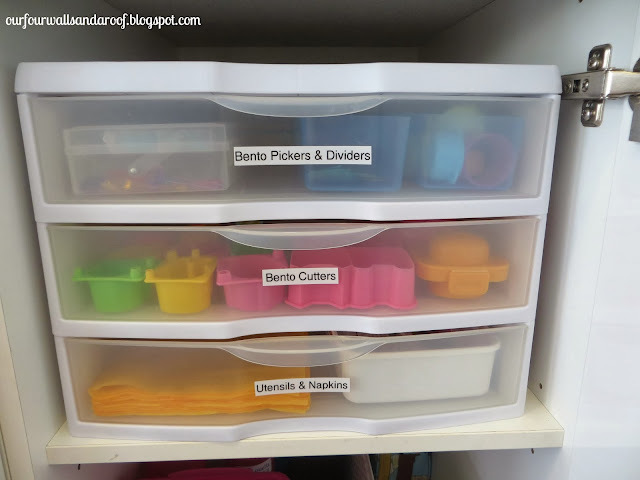 And lastly, the basket is where I store all the containers. I love how I can slide this out and get what I want. Having this setup makes assembling lunch so quick, I just reach in and grab what I want. 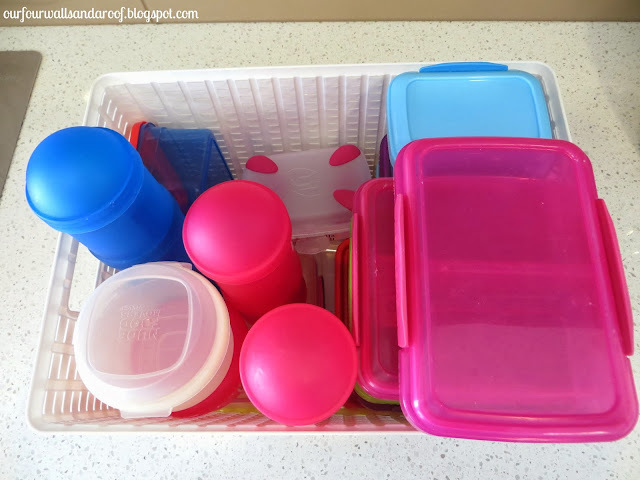 I'm looking forward to getting more organised lunch boxes like Laptop Lunches and I will then rehome majority of the plastic containers in the basket. We don't use any plastic bags at school. What is your favourite lunch box or Bento accessory? 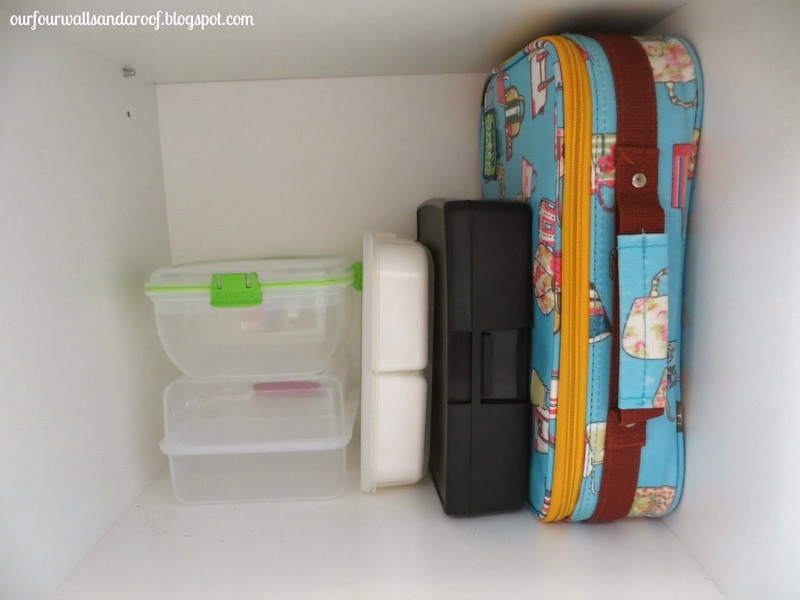 I'd also love to hear how you store your lunch boxes. wow this is amazing - had no idea about the whole Bento thing, all those little shapes etc are so cute!! not quite sure I would have the time/motivation to add all those little touches every day but I bet your daughter loves it :) so organised too, I am inspired! I just ordered the Planetbox Rover as my daughter is starting school this year. So excited to start using it and might try to rustle up some fun bento stuff too.